Shopping on the internet for anything is actually the trend today. I remember a survey once that said that people would rather shop from their homes during the holiday season to avoid long queues and the rush. So that’s another point to e-commerce. 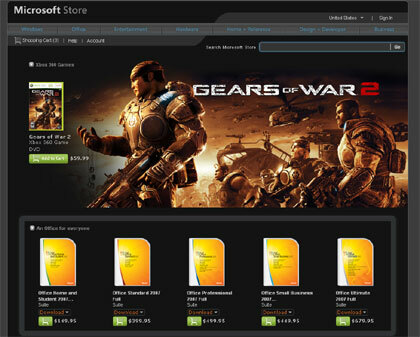 Today, Microsoft joins the bandwagon (again) by launching their online store in the US. The Microsoft Store (previously opened internationally in the UK and Korea) will be selling hardware and software Microsoft products. Trevin Chow, Senior Program Manager at Microsoft announces in his blog, "With this launch, our customers in the U.S. are able to buy first-party software and hardware directly from Microsoft offered in a comprehensive online catalog. On our store, you’ll find products from many categories, ranging from Office 2007 Home and Student and Zoo Tycoon 2 to Xbox 360 Wireless Controllers and the new Zune with that cool Buy from FM feature." Software products bought from the MicrosofStore can be delivered in two ways package door to door delivery or digitally. The digital delivery of the software means that after payment, the customer can simply download the software package and install it immediately. Basically, digital delivery is exactly the same as Electronic Software Distribution (ESD) This saves everybody delivery charges and waiting time. However, hardware products such as the Zune, Xbox accessories and anything tangible have to be delivered via courier. Of course delivery charges apply and so do wait times.